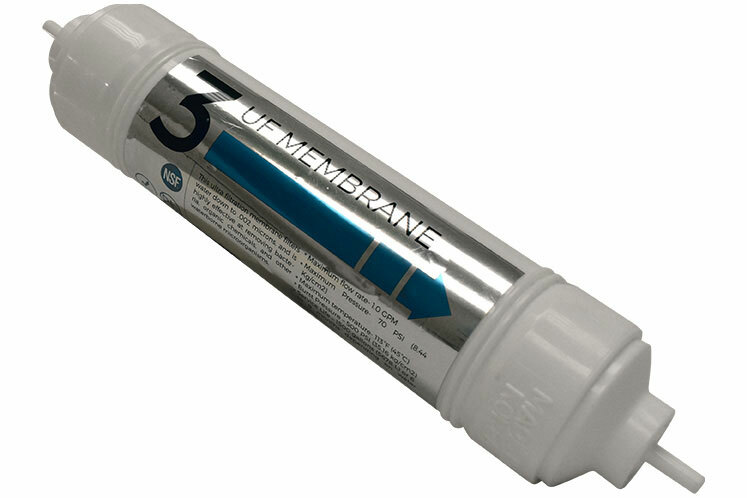 The 0.2 micron H2O Inline Ultrafiltration (UF) Membrane Filter is designed for use with Bottleless Water Coolers and Reverse Osmosis systems and other filtration systems where an inline Ultrafiltration filter is required, such as where water is biologically unsafe or may have bacteria or other biological contaminants. Ultrafiltration(UF) is an important purification technology used for the production of high-purity water. UF is effective for the removal of colloids, proteins, bacteria, viruses, parasites protozoa and pyrogens, (e.g., gram-negative bacterial endotoxins), and other organic molecules larger than .01 Micron size and most other water contaminations known today. Also removes pesticides and herbicides, as well as the hardness in water and salts.